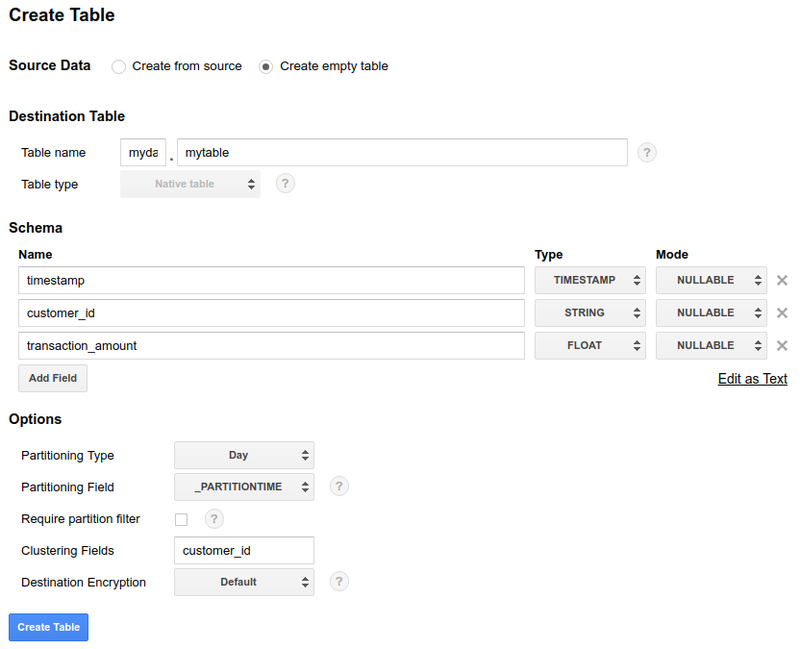 This document describes how to create and use clustered tables in BigQuery. Currently, clustering is supported only for partitioned tables. Only standard SQL is supported for querying clustered tables and for writing query results to clustered tables. You can only specify clustering columns when a table is created. After a clustered table is created, clustering columns cannot be modified. Clustering columns must be top-level, non-repeated columns of one of the following types: INT64, STRING, DATE, TIMESTAMP, BOOL or NUMERIC. For more information on data types, see Standard SQL Data Types. You can specify up to four clustering columns. Currently, you can only cluster a partitioned table. This includes both ingestion-time partitioned tables and partitioned tables (tables partitioned by a TIMESTAMP or DATE column). In addition, because the bigquery.user role has bigquery.datasets.create permissions, a user assigned to the bigquery.user role can create clustered tables in any dataset that user creates. By default, when a user assigned to the bigquery.user role creates a dataset, that user is given OWNER access to the dataset. OWNER access to a dataset gives the user full control over it and all the tables in it. You specify clustering columns when you create a table in BigQuery. After the table is created, you cannot modify the clustering columns. Currently, you can only specify clustering columns for a partitioned table. Clustering columns must be top-level, non-repeated columns, and they must be one of the following simple data types: INTEGER, STRING, DATE, TIMESTAMP, BOOLEAN or NUMERIC. You can specify up to four clustering columns. When you specify multiple columns, the order of the columns determines how the data is sorted. For example, if the table is clustered by columns a, b and c, the data is sorted in the same order — first by column a, then by column b, and then by column c. As a best practice, the most frequently filtered or aggregated column should appear first. The order of your clustering columns also affects query performance and pricing. For more information on query best practices for clustered tables, see Querying clustered tables. On the Create table page, in the Source section, for Create table from, select Empty table. Enable Edit as text and enter the table schema as a JSON array. Use Add field to manually input the schema. For Partitioning, select Partition by ingestion time. For Clustering order, enter between one and four comma-separated field names. 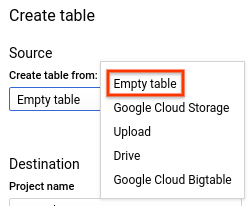 Note: When you create an empty clustered table using the BigQuery web UI, you cannot add a label, description, table expiration, or partition expiration. You can add these optional properties when you create a table using the CLI or API. After the table is created, you can update the clustered table's table expiration, description, and labels. You cannot add a partition expiration after a table is created using the BigQuery web UI. Clicking Edit as text and entering the table schema as a JSON array. Using Add Field to input the schema. For Partitioning Type, click None and choose Day. Choose timestamp to create a table partitioned by a DATE or TIMESTAMP column. Choose _PARTITIONTIME to create an ingestion-time partitioned table. For Clustering columns, enter between one and four field names. --table (or the -t shortcut). --schema &mdash: You can supply the table's schema definition inline or via a JSON schema file. Either --time_partitioning_type (for ingestion-time partitioned tables) or --time_partitioning_field (for partitioned tables). Currently, DAY is the only supported value for --time_partitioning_type. --clustering_fields to specify up to four clustering columns. Optional parameters include --expiration, --description, --time_partitioning_expiration, --destination_kms_key, and --label. [COLUMN] is the name of the TIMESTAMP or DATE column used to create a partitioned table. If you create a partitioned table, you do not need to specify the --time_partitioning_type=DAY flag. [COLUMNS] is a comma-separated list of up to four clustering columns. Enter the following command to create a clustered table named myclusteredtable in mydataset in your default project. The table is a partitioned table (partitioned by a TIMESTAMP column). The partitioning expiration is set to 86,400 seconds (1 day), the table's expiration is set to 2,592,000 (1 30-day month), the description is set to This is my clustered table, and the label is set to organization:development. The command uses the -t shortcut instead of --table. The schema is specified inline as: timestamp:timestamp,customer_id:string,transaction_amount:float. The specified clustering field customer_id is used to cluster the partitions. Enter the following command to create a clustered table named myclusteredtable in myotherproject, not your default project. The table is an ingestion-time partitioned table. The partitioning expiration is set to 259,200 seconds (3 days), the description is set to This is my partitioned table, and the label is set to organization:development. The command uses the -t shortcut instead of --table. This command does not specify a table expiration. If the dataset has a default table expiration, it is applied. If the dataset has no default table expiration, the table will never expire, but the partitions will expire in 3 days. The schema is specified in a local JSON file: /tmp/myschema.json. The customer_id field is used to cluster the partitions. Call the tables.insert method with a defined table resource that specifies the timePartitioning property, the clustering.fields property, and the schema property. Write the results to a new destination table and specify the clustering columns. This method is discussed below. By using a DDL CREATE TABLE AS SELECT statement. For more information on this method, see Creating a clustered table from the result of a query on the "Using Data Definition Language Statements" page. You can create a clustered table by querying either a partitioned table or a non-partitioned table. You cannot change an existing table to a clustered table using query results. When you create a clustered table from a query result, you must use standard SQL. Currently, legacy SQL is not supported for querying clustered tables or for writing query results to clustered tables. You cannot specify clustering options for a destination table when you query data using the console BigQuery web UI unless you use a DDL statement. For more information, see Using Data Definition Language Statements. You cannot specify clustering options for a destination table when you query data using the classic BigQuery web UI unless you use a DDL statement. For more information, see Using Data Definition Language Statements. Specify the use_legacy_sql=false flag to use standard SQL syntax. [QUERY] is a query in standard SQL syntax. Currently, you cannot use legacy SQL to query clustered tables or to write query results to clustered tables. The query can contain a CREATE TABLE DDL statement that specifies the options for creating your clustered table. You can use DDL rather than specifying the individual command-line flags. 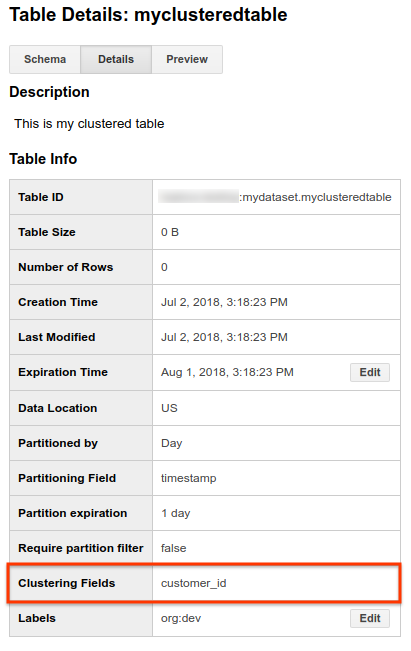 Enter the following command to write query results to a clustered destination table named myclusteredtable in mydataset. mydataset is in your default project. The query retrieves data from a non-partitioned table — mytable. The table's customer_id column is used to cluster the table. The table's timestamp column is used to create a partitioned table. To save query results to a clustered table, call the jobs.insert method, configure a query job, and include a CREATE TABLE DDL statement that creates your clustered table. You can create a clustered table by specifying clustering columns when you load data into a new table. You do not need to create an empty table before loading data into it. You can create the clustered table and load your data at the same time. To define clustering configuration when creating a table via a load job, you can populate the configuration.load.clustering message, populating the configuration.load.clustering.Fields property with up to four clustering columns in prioritized order. You cannot assign access controls directly to clustered tables or to partitions. You can control table access by configuring access controls at the dataset level or at the project level. In the Resources pane, click your dataset name to expand it, then click the table name you want to view. Click Details. This page displays the table's details including the clustering columns. Click Details. The Table Details page displays the table's details including the clustering columns. Enter the following command to display all information about myclusteredtable in mydataset. mydataset is in your default project. For clustered tables, you can query the CLUSTERING_ORDINAL_POSITION column in the INFORMATION_SCHEMA.COLUMNS view to retrieve information about your clustering columns. 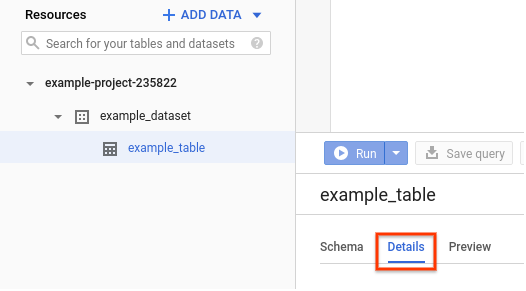 You can list clustered tables in datasets by using the GCP Console, the classic BigQuery web UI, the bq ls CLI command or by calling the tables.list API method. The permissions required to list clustered tables, and the steps to list them are the same as for partitioned tables. For more information on listing tables, see Listing partitioned tables in a dataset. Support for clustering native (non-partitioned) tables. Reducing the costs for particular types of queries that use filters on clustering columns. For an overview of clustered table support in BigQuery, see Introduction to clustered tables.